HR secrets every manager should know. People power your business-and success can hinge on your hiring, inspiring, and keeping the right ones. As a manager, are you cultivating this vital resource? Is there more you could be doing? Are you just winging it? Every HR executive has a laundry list of things they wish managers knew: best practices that would enable the entire organization to operate more effectively...transforming those managers into exceptional-and highly promotable-leaders. 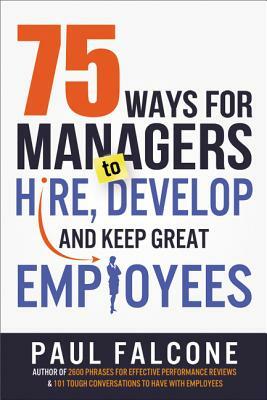 Now in this accessible and practical playbook, HR expert and author Paul Falcone shows readers how to: Identify the best and the brightest talent * Hire for organizational compatibility * Communicate constructively * Address uncomfortable workplace situations * Create an environment that motivates * Retain restless top performers * Reengage your team after a layoff or during times of adversity * Skillfully conduct performance reviews * Take corrective action * Sidestep litigation landmines * Delegate in a way that develops your staff * And much, much more From recruiting to retaining, 75 Ways for Managers to Hire, Develop, and Keep Great Employees has all the advice you need to overcome your toughest people challenges.